Mylee served in the US army on active duty for over 12 years, retiring in March 2014. During her time in Afghanistan, she was a pivotal member of the Special Operations Cultural Support Team, enabling gains in information, and cultural insight, and helping to promote governance for Afghan families. It was while in the service of her country that she found a mass in her left breast. This was eventually discovered to be stage 3 breast cancer. As she does with all things, Mylee treated this diagnosis as a challenge, rather than a sentence, and overcame it the same mentality she used in combat – never stop fighting. Today, Mylee is a spokesperson for Manning Up USA, along with fellow veterans, and survivors of abuse. Mylee is also a certified trainer, teaching a tried, and tested mix of self acceptance, and self betterment, through health & fitness. 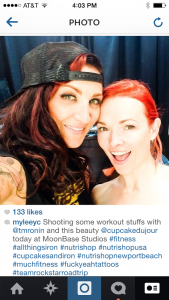 Just this past week, Mylee saw a new challenge to fruition – competing in her first fitness competition! She tracked the journey via social media, and shared her results, and final figure accomplishments with her followers, and fans, via social media. I learned so much during our shoot! Typically, fitness shoots are accomplished with lower weights, and reps, so that poses can be held while photographed. When you’re as tough as Mylee, lower weights are not an option. Towards the end of the shoot, we played around with some super fun, super tough acro yoga – where I literally put my life in Mylee’s hands… or should I say… feet. My favourite thing about these photos is how they display the teamwork, and trust necessary to succeed not only in fitness, but in life! When you invest in yourself, and those around you, you can achieve heights, and success’ that would be impossible solo. Though we come from different backgrounds, Mylee and I share this thought process, and have benefitted from it’s application to our journeys in life, and fitness. I feel incredibly fortunate to call Mylee my friend. Not only due to her many accomplishments, but because of the strength, class, and beauty she displays each, and every day, and the good she does for all those around her. Despite her many, and varied experiences here, and abroad, her smile is effortless, and her laugh is infectious. She is fun, lighthearted,and completely approachable. Follow along, and see for yourself!